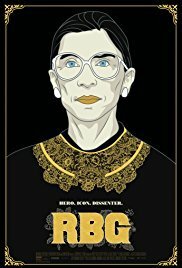 Justice Ruth Bader Ginsburg's life story has been made into an epic, informative and inspirational film. Ruth Bader Ginsburg is a Chief Justice in the American legal system and has presided over laws that have been made in America. She is now in her 80's and is a rockstar in America. She still goes to the gym and has been reported to say that she must stay alive until after Trump has gone from office! The film frames her life story in such a way that you think 'wow'. Her legal career started when she was one of two women allowed into her class in the 1950's. It then tracks through her husband's illness and the sacrifices she made for her children and her husband before her legal career began to fly. Her husband demonstrates qualities in a man that were simply way ahead of his time. For any feminist or woman/man who is out there looking for inspiration, this is well and truly worth viewing.